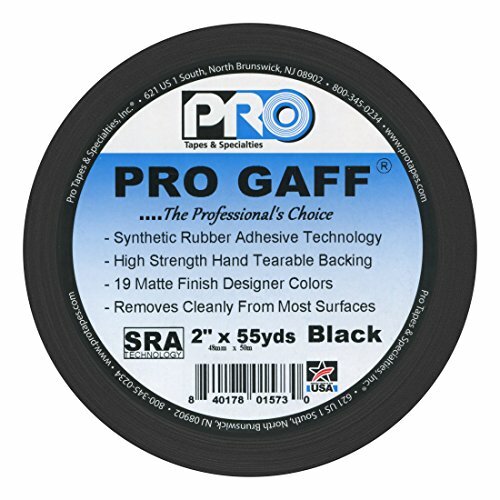 The ProTapes Pro Gaff black gaffer's tape is 11 mil thick, 2" wide, and 55 yd. long, and is made from matte cloth with a rubber adhesive to conform to irregular surfaces and remove cleanly without residue from most surfaces. The tape, also known as gaffer or gaffers' tape, is printable and suitable for a range of applications including wire and equipment labeling as well as temporary cable hold down and sealing. It resists abrasion and can be torn by hand. The tape can be used outdoors and withstands temperatures from 50 to 200 degrees F. Tensile strength is 45 lb. per inch. ProTapes & Specialties manufactures pressure-sensitive tapes. The company, founded in 1977, is headquartered in North Brunswick, NJ.